A CURIOSITY OF CATS A HIT! Help Support Our Program. Buy a book! The Cat Book looks great! Printer did a fine job. The content is excellent. Everyone who took part in the contest has a great deal to be proud about. Now is a good time for you, as a member, to think about what our program has meant to your life. Since we don't have dues, we very much need help from members in order for our program to grow. What better way than ordering several copies for yourself, your family, and your friends? When you hold the book in your hands and read it you will see what a fine job it is and be proud to be part of the community that produced it. Your support will also make it possible to do more books in the future. We hope next to do a collection of nonfiction stories. So click the link below and give a hand to us and to all the writers we have helped in the past and will help in the future. You won't be sorry. You'll be delighted! The book is a 120 page paperback at 6" X 9" and contains 29 stories. The list of the stories can be found by clicking this link. All upfront costs for this project were paid by the foundation. If we can break even, fine. If we can make a profit, even better. If we can make enough profit to do another book, maybe a collection of nonfiction stories, great! Thank you for making our program possible through your hard work in creating our raw material--your stories. Thanks especially to those who helped us judge the stories! Order books now! Click here! Read the stories in the book. 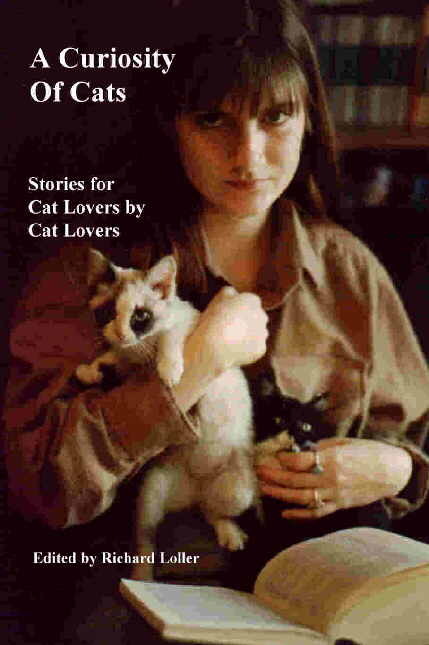 Visit the Cat Story Shelf and read all the entries. Contact us with questions or suggestions.